Pottery master stein, relief, 3.0L, pewter lid. Same model number applied to six 0.5L drinking steins. The central image on the master stein depicts Prince Regent Luitpold, de facto ruler of Bavaria from 1886 through 1912. 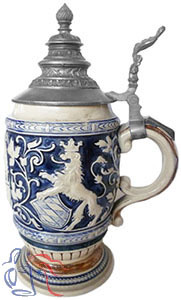 The images drinking steins in this serving set each depict various other members of the Bavarian royal family in the years leading up to World War I.